SOM: Many of your poems are futuristic as much realistic. If one takes ‘Kurigalu Saar Kurigalu…’ it is true to the prevailing political and social situation. Whether it is theocracy, autocracy, democracy or communism we as ‘Kurigalu,’ can never change. Is it an awakening call that we should change? Prof. Nissar Ahmed: I wrote it on one critical situation and that situation is not static and it happens every day. Even now, Kannada people all over the world wherever they are — it could be America, Australia, England, Abu Dhabi, Kuwait, Qatar, Bahrain or any Middle East country — whenever I am invited they sing this song. So I have asked them why they sing this song. They tell me that they have been singing it from the last 35 years and they were not doing it just because I was there. It means ‘Kurigalu Saar Kurigalu’ has become popular. All because of Mysore Ananathaswamy who gave wings to my poems. Otherwise, they would have remained in the cage of books. It was his tune scored for the song that made the song popular. It attained proverbial heights and became almost an idiom because the same situation that occurred in 1963 persists even now. Even in future it will continue. SOM: What made you write two diverse poems as ‘Nityotsava’, Karnataka’s signature song and ‘America America’, which describes its super power and our awe of that country? Prof. Nissar Ahmed: America played foul throughout history, dividing nations. They sowed seeds of hatred against Russia and China. One must remember that they are also human beings and they have their own ‘isms,’ which we should tolerate. America does not like it. It wants to be the Big Brother and control other countries. It has also sowed vicious seeds in the minds of youngsters and intellectuals, I felt very sorry. During Vietnam War, they interfered deliberately and it was criminal. Vietnam is a small country and still it fought against America for nearly ten years. Now it is the turn of North Korea. Kim Jong-un is threatening to bomb America and we all know that it can never happen. When it challenges, it should be looked upon sympathetically. Just because America wants a base in South Korea, it supports them and hates North Korea. So they became alert and started manufacturing bombs in defence. If America manufactures bombs it is for world peace and when other countries do it, they become world destroyers. I did not like this dual policy and that is reflected in that poem. My mind was filled with Shivamogga as I was transferred there. Jog Falls was very close and I used to cross Thunga River every day on an old bridge to reach Sahyadri College. 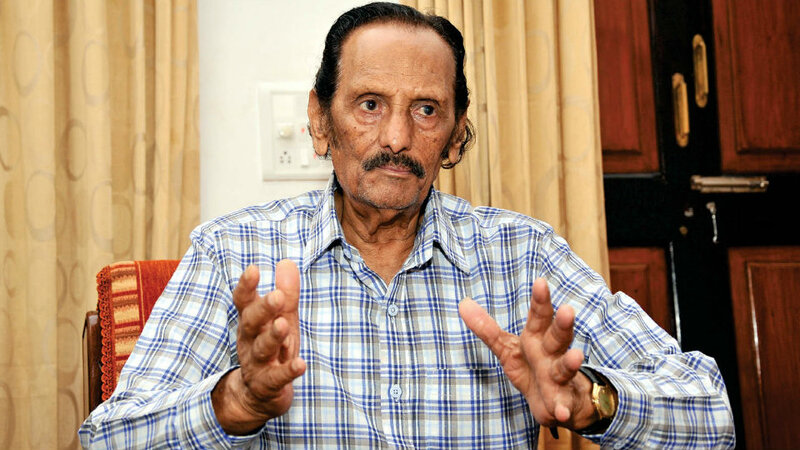 Several great personalities came from Shivamogga — Kuvempu, for a while U.R. Ananthamurthy, Ha. Ma. Nayak and several other writers. All of them made me write about my culture, language, life and history of people — ‘Ithiasada Himadallina…’ I wanted to convey that Mother Earth is saluting Kannada Maathe daily. It is eternal — Nitya Utsava. Nitya means daily, every day. It is Shashvata and Chira — permanent and eternal. SOM: Sir, even in the poem ‘Mysuru Zoo’, you look at the inanimate museum and the animated Zoo and end with “In the Zoo, amidst life, the museum looks like it is dead.” (And this is my own translation Sir). What triggered the thoughts? Prof. Nissar Ahmed: The translation is good. I wrote this poem during former PM Indira Gandhi’s rule. She was a powerful leader but unfortunately due to some folly, Emergency was declared. A lot of things happened. I have my own views about it and I do not want to talk about it because people will think I am biased. She curtailed her own growth and became a victim of circumstances.That is when I wrote that poem. I compared the Zoo to my country and Indira Gandhi to the curator. If you read it carefully it gives a picture of political leaders of our country. That is the purpose. The second is the Zoo. There is a museum also where there are both animate and inanimate specimens. There is life and death also. Life and death go hand-in-hand. SOM: Kuvempu was celebrated at this year’s Flower Show in Lal Bagh. Prof. Nissar Ahmed: Yes, it was wonderful. SOM: You said that you used to sit under a tree opposite to where the event was taking place. Why did you go to study in Lal Bagh? Prof. Nissar Ahmed: My house is very near to Lal Bagh. Actually, from my primary school days I studied in Doddamavalli and Lal Bagh is a part of Doddamavalli. My house was located by the side of Lal Bagh wall and a road connected it and my house. My father was a food inspector then and he was given a good house. My only entertainment was Lal Bagh then and I would go there every day. When I joined Intermediate in Government Arts and Science College, I stayed with my uncle there as my father was transferred to Anekal. My uncle’s house was also near Lal Bagh. It was a sheer coincidence. Early in the morning I used get up, have a cup of tea in the Kaka Muslim Hotel near a mosque and then go to Lal Bagh. I would go at 5 am, sit under the tree which was very calm. READ ALSO "There is shortage of teachers not only in India but all over the world"
The flower show was dedicated to Kuvempu. I saw that tree where I would sit for three to four hours daily for over two years. The moment I remembered it, I became nostalgic and went on thinking about those old memories. I have mentioned that in that event — this tree is an important part of my life. I used to come and study under the tree as there was a lot of disturbance near my house. I would return home, have breakfast and then go to college. SOM: Kuvempu got you a geology lecturer’s job in Central College. As a geologist, you have mined poetry brilliantly. How do you feel about this quirk of fate? Prof. Nissar Ahmed: Poetry has been my vocation and conviction from the beginning. Just because I had taken geology I could not forgo my inner instinct that was poetry. I took geology as I could not secure good marks in mathematics. I had to take CBG (Chemistry, Botany and Geology) as it was inevitable, not that I wanted it. But only good things happened after that because geology is nearer to poetry and literature than any other science. Prof. Nissar Ahmed: Yes, you see there are volcanoes, earthquakes, lot of rivers and we teach about oceans. It was God’s gift and a quirk of fate that favoured me. SOM: Even a person like me who does not understand poetry much, if he reads ‘Nimmodaniddu Nimmanthagade,’ it looks like there is pain, agony, anger, or plain doubts. Were you compelled to write and when did you get these feelings? Prof. Nissar Ahmed: In the 1960s there was a sort of unhealthy competition among my contemporary writers, my colleagues, laced with a streak of casteism. Our Navya Kavya poets who were seen as intellectuals seemed to have a closed mind which I do not want to talk about now. There was no open mindedness. If I were to write in Navya style I had to accept some values and people or else I was not accepted into the circle. Such were the times. There was another opposite view. Those who did not like Kuvempu or Da. Ra. Bendre were not poets themselves. Such conflicts were there. If I wrote poetry that was easily understood by people, then you became a pot-boiler and it pained me a lot. They would suspect about one‘s caste and religion and with a lot of pain, I wrote ‘Nimmodaniddu Nimmanthagade’.